1740: born in Kyôto. Son of the dôkegata actor. 12th day of the 11th lunar month of 1756: his father Ogurayama Hyakumatsu II dies. 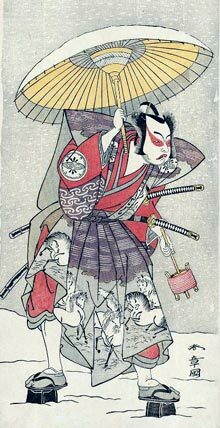 1st lunar month of 1758: first Kabuki adaptation of the puppet theater drama "Gion Sairei Shinkôki", which is simultaneously produced at the Minamigawa no Shibai [casting] and the Kitagawa no Shibai [casting]; Sentarô plays in the former theater the role of Miyoshi Shurinotayû Masayasu. 11th lunar month of 1759: Nakamura Jûzô I and his disciple Ogurayama Sentarô respectively take the names of Nakamura Kichiemon I and Nakamura Jûzô II at the Minamigawa no Shibai, playing together in the kaomise drama "Hônen no Miyako Mutsuki no Kotobuki", which is produced by Sawamura Kunitarô I and also celebrates the shûmei of Matsuya Shinjûrô and Yamanaka Heijûrô II. 1st lunar month of 1764: Jûzô plays at the Minamigawa no Shibai the roles of Murakoshi Sanjûrô and Môri Terumoto in Namiki Shôzô I's ni-no-kawari drama "Keisei Hana no Shiroyama", which is produced by Arashi Matsunojô III. 17th day of the 6th lunar month of 1770: his adoptive father Nakamura Kichiemon I dies. Fall 1771: Jûzô goes to Edo. 11th lunar month of 1771: Jûzô plays at the Moritaza the role of Fuwa Banzaemon in the kaomise drama "Fukikaete Tsuki no Yoshiwara", which celebrates the arrival of the new zagashira Ichikawa Danjûrô V.
1st lunar month of 1772: Jûzô plays in the same theater the role of Soga Gorô Tokimune in the new year drama "Hatsu Akebono Niwatori Soga"; the roles of Soga Jûrô Sukenari and Kudô Saemon Suketsune are played by Ichikawa Danjûrô V and Nakamura Tomijûrô I. 1st lunar month of 1774: Jûzô plays in the same theater the role of Kudô Saemon Suketsune in Horikoshi Saiyô's new year sogamono "Kite Hajime Hatsugai Soga"; the roles of Soga Gorô Tokimune and Soga Jûrô Sukenari are played by Ichikawa Yaozô II and Bandô Mitsugorô I. Fall 1774: Jûzô goes back to Ôsaka. 11th lunar month of 1774: Jûzô plays at the Naka no Shibai in the drama "Gosho Zakura Horikawa no Youchi". 1st lunar month of 1775: Jûzô is listed in the Ôsaka hyôbanki in the "kanjiku sampukutsui" section (a trio of kanjiku tachiyaku actors), along with Arashi Kichisaburô I and Nakayama Raisuke I. 4th lunar month of 1775: premiere in Ôsaka at the Naka no Shibai of Nagawa Kamesuke I's drama "Hade Kurabe Ise Monogatari"; Jûzô plays the role of Ariwara no Yukihira [more details]. 1st lunar month of 1780: Namiki Gohê's drama "Kinmon Gosan no Kiri" is produced for the first time in Kyôto; Jûzô plays the roles of Hayakawa Takakage and Mashiba Hisayoshi [casting]. Summer 1781: tour in Nagoya, Matsuzaka and Ise. Summer 1782: Jûzô goes to Edo. 8th lunar month of 1782: Jûzô plays at the Moritaza in the drama "Koko ga Otoko no Tatehiki Tokoro". Fall 1782: Jûzô goes to Kyôto. 11th lunar month of 1782: Jûzô plays in Kyôto the roles of Katô Saemon Shigeuji and Araki Saemon in the kaomise drama "Gosekkyô Suehiro Keizu", which celebrates the shûmei of Nakamura Utaemon II. 1st ~ 4th lunar months of 1784: tour in Nagoya with Nakamura Tomijûrô I. End of 1784: Jûzô goes to Edo. 11th lunar month of 1785: Jûzô plays at the Kiriza the roles of Watanabe no Tsuna and Tawara Senju in the kaomise program "Otokoyama Furisode Genji", which celebrates the shûmei of Bandô Mitsugorô II. 11th lunar month of 1786: Jûzô plays at the Kiriza in the kaomise program "Mutsu no Hana Izu no Hataage", which celebrates the shûmei of Nakayama Kojûrô VI who takes back the name of Nakamura Nakazô I. 11th lunar month of 1787: Jûzô plays in Kyôto at the Nishi no Shibai in the kaomise drama "Koko ni Kiwamaru Gojin no Sonae". 1st lunar month of 1788: Jûzô's rank in the Kyôto hyôbanki, tachiyaku section, is jô-jô-kichi (superior - superior - excellent). 2nd lunar month of 1788: premiere at the Ônishi no Shibai of the drama "Gishinden Yomikiri Kôshaku"; Jûzô plays the roles of Ôboshi Yuranosuke and Nikki Tamon-no-Kami [more details]. It was supposed to be staged first in Kyôto at the beginning of the month at the Nishi no Shibai but the theater was destroyed by fire the 29th day of the 1st lunar month. The troupe goes to Ôsaka to perform at the Ônishi no Shibai and to celebrate the shûmei of Kataoka Nizaemon VII. 3rd lunar month of 1788: Jûzô leaves the Ônishi no Shibai to join the Naka no Shibai. 5th lunar month of 1788: Jûzô appears on stage for the last time, in Ôsaka at the Naka no Shibai, playing the role of Masaki Otoemon in the drama "Takakiyabashi Kenka no Shôbuzuke". 12th day of the 6th lunar month of 1788: Jûzô dies in Ôsaka. Nakamura Jûzô II was a talented and popular tachiyaku actor, who spent most of his career during the second half of the 18th century in Kamigata and made some successful stays in Edo. His two fields of excellence were wajitsu and budôgoto. He was said to be "personally charming and a brilliant actor" (according to "The Actor's Image").